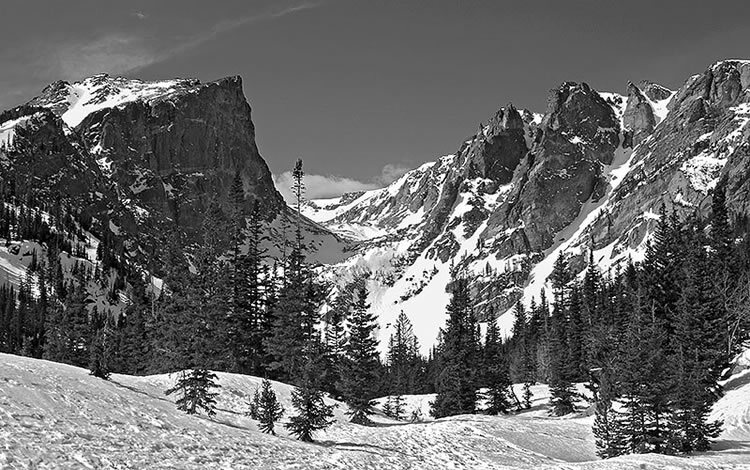 Rocky Mountain National Park really shines in the winter time and one of the best ways to experience everything Rocky has to offer is on a Snowshoeing Nature Safari. If you can hike and jog slowly downhill you can snowshoe! Once at the trail head we'll hike/snowshoe the trails to explore a world under a blanket of white powder. It's important to note we never see large wildlife while snowshoeing, but we will see tracks of Pine Squirrels and Snowshoe Hares. Snowshoeing Conditions: March 17th - Snow getting hard due to warmer conditions. On a 3.5 hour Snowshoeing Safari we can head up to some beautiful locations going up to two miles round trip. Some days we can't see the mountains due to the cloud layers but the snowshoeing itself can be exceptionally fun. Going up is generally slow and depends on your group's fitness level. We take a number of rest breaks to catch our breath. Depending on the snow conditions the trail can become narrow and at times angled on steeper hillsides, this does require some athletic-ness and being open to jog down hills to avoid falling. The slower you go down hill the more likely you fall. This kind of trip is great for first time snowshoers and should only be avoided by folks with some kind of heart or breathing condition, or folks with ankle, knee, or back issues. On the way down we can use side trails and head off trail to get the full experience of snowshoeing in deep snow. If we have just the right snow conditions on the way down we can also take some slides sitting on your rear end as you slide down a hillside. We will also do some downhill jogging and in a few spots snowshoe sliding while standing for a foot or two on the steeper declines. On a 6 or 8 hour snowshoeing tour we can go much farther, up to 3 or 4 miles or more one way to see some of the most amazing winter landscapes in North America. For those options check ou the Hiking Tour page for more details on the trails. These trips are recommend for folks in good physical shape that walk or hike on a regular basis. Longer trips offer more off trail hiking when we head downhill, but there are generally fewer if any sliding opportunities. Tour Details: All tours are private, only the people you invite will come along. Snowshoes, poles, and gators are included with the tour. Groups are limited to four people to ensure each person has a quality experience with our naturalist. Limited to children 12 and up. If your kids are under 16 please read the Safari FAQ to make sure this tour is for your family. Binoculars are available for each person as well as use of a spotting scope to really bring those distant creatures into view. If you are staying for a few days you may consider renting a pair of snowshoes and poles for your entire stay from the Warming House. Sunscreen, water and snacks are provided for all guests. Be sure to dress warm and in layers, most days feature 20-30mph winds and very chilly wind chills as we go in and out of the forest to the openings of the lakes. Ankle high winter or hiking boots are also recommended. Avoid cotton socks and jeans as they absorb water. Warm people have more fun. *Not included: Park entrance fees are $25 per day or $35 for a 7 day pass.